It's fast. You can create an auction today, and get paid for your item within a week. It doesn't cost a lot. You can start for free if you sell items you already own. Your expenses come after you've made a sale and have been paid. There is a ready stream of buyers. There are over 152 million active users on eBay, according to Statista. Plus, now that eBay has a mobile app, it’s easier than ever to buy and sell on eBay. The site is so successful at helping sellers reach buyers, 40% of home businesses that sell online don’t have a website and instead use only eBay or Amazon. But even with these advantages, it takes more than posting a few auctions to make a steady income from eBay. Like any business, you need to research, plan and then implement and evaluate your plan. Here are nine steps to getting started and making a living on eBay. If you've never bought or sold something on eBay before, now is the time to do it. Taking a test drive on eBay will not only help get familiar with the system but also, determine if it's something you want to turn into a home business. 1. Sign up for a free account. If you know you want to build a business, use the eBay business account sign-up option. If you’re not sure if you want to commit to a business and want to test drive eBay instead, use the regular eBay registration. Sign up for a PayPal account, which will make it easy for buyers to pay you as soon as the item sells. It’s faster and safer than taking checks. And since eBay owns PayPal, they're integrated so that you can send a PayPal invoice through eBay to your buyer. 2. Buy something. The best way to get a feel for eBay selling is to do a transaction as a buyer first. Pay attention to the listings that attract you, such as the photo, headline, and price. Many are run as auctions, where you need to bid by indicating a price you’re willing to pay. You can set a max price, and eBay will submit your bids by increments for you until you hit the max price. Some sales are fixed prices, where buyers can “Buy Now.” These don’t require bidding and the item can be bought right away as opposed to waiting until the auction ends. 3. Sell a few items. Before you go all in on an eBay business, test out eBay by selling a few items. This will give you a sense of how the platform works, time to assess your offers, and begin to develop a system of listing, packaging, and shipping. Start by finding things around your home that you don't want and listing them. Take quality photos and write detailed descriptions. Set an opening bid price to entice bidders. Decide if you’ll offer a guarantee and the ability for the buyer to return the item if he’s not happy. Outline your shipping policy, such as how it will be shipped, who pays and how much it will cost. eBay offers a shipping calculator to help with this. Check out other listings of a similar product to see how other sellers set up their listings. 4. Send an invoice to the winning buyer through the eBay interface. Some buyers will pay even before you invoice. If not, you can send a PayPal invoice from within your eBay account. Once payment is made, pack up the item and ship it asap. 5. Give and ask for feedback. Feedback is crucial to eBay success. If your buyer pays quickly, leave positive feedback through eBay’s feedback system. Don’t forget to ask your buyer to give you feedback once they receive the item. Make sure that your item was delivered as described and arrives quickly to ensure good feedback from your buyer. After you’ve made a few sales, you should be able to decide if you’d like to build a full-fledged eBay business. If so, here’s how you can take your eBay sales to the next level. 6. Pick a Niche. Eventually, you’ll run out of items around your home, so you’ll need to find a new source of inventory. There are a couple of ways you can do this. Based on what sold well in your home, you can find more sources of those items. Places to look are yard sales and thrift stores. Or sometimes people sell items in bulk, that you can buy, break up and sell by piece. Another option is to find products through a drop-shipper or wholesaler. These companies sell products at discounted prices that you can then sell to make a profit. Drop shipping companies will handle the order and shipping, adding your business label for a fee. A wholesaler sells items to you in bulk that you will then sell and ship. Many eBayers focus on a specific product or type of product. Others follow trends, selling what’s popular, which requires a little bit of research. Be careful about being swayed by get-rich-quick-on-eBay offers. It’s always best to focus on items you’re knowledgeable about. 7. Set up your business. If you plan to make regular, steady income from eBay, you need to set up an official home business, including getting a business name, obtaining a license required by your city or county, and developing a business plan. 8. Run your eBay business like a business. Along with a steady stream of quality products, you need to provide great customer service, pack items well and ship them quickly, manage your inventory, and keep track of your business finances. 9. Open an eBay Store. If you’re doing well, you may want to take advantage of eBay’s store option. 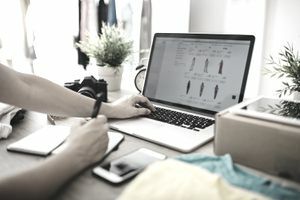 Having a store provides many advantages over regular eBay selling including a custom online store, increased free listings, lower final value fees, marketing tools and more. There are many places you can sell items online without having to create your e-commerce site. While many of them are great options, eBay was a first and remains a popular go-to site for people to buy and sell.